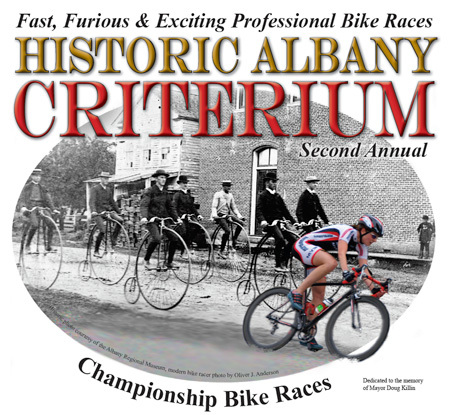 Organizers expect between 400 and 600 bicycle racers for the second annual Historic Albany Criterium in downtown Albany on Saturday, Aug. 15. The event is the setting for the Oregon Bicycle Racing Association’s Criterium Championship this year. The event includes a full slate of categories for junior and senior men and women and uses a 1-kilometer circuit — about 0.6 miles — on downtown streets. Races are scheduled from 10 a.m. to 6 p.m. The criterium format on city streets with multiple laps and turns is exciting for spectators and racers, according to Jim Lawrence, one of the organizers and a member of the Albany Bicycle and Pedestrian Advisory Commission. The start will be on Washington at Second. Riders go north on Washington, right on First, right on Ferry, left on Third, right on Broadalbin, right on Fourth, and right on Washington to the finish at Second. Fans can be up close to the riders as they speed by each lap and can move about the course viewing the race from different perspectives. There is no admission charge for spectators. My wife and I were in Downtown Portland last weekend and ran into the Portland Twilight Criterium on the way back to our hotel. The excitement and atmosphere around the event was very cool and seeing the action up close was really awesome. I couldn’t help but snap away with the camera while soaking in the speed these guys displayed! See below for a sample, and if you need more proof, check out the nearly 300 images I took of the race. We’re looking forward to checking out the championship on Saturday while sipping on a Calapooia brew! See you there!